Alfalfa Hay | Anderson Hay & Grain Co., Inc.
Alfalfa hay is an excellent source of good quality protein and fiber. Alfalfa is a legume hay in the pea family and is sometimes called “lucerne”. These hays are higher in protein and minerals and are more palatable than grass hays. Alfalfa in particular is high in energy and is an excellent source of vitamins and minerals. When properly cured, alfalfa is the best of the legume hays from a nutrient standpoint. It has the most feed value of all the perennial pasture forages. Alfalfa is used as for horses, dairy cows, beef cattle, sheep, chickens, turkeys and other farm animals. With its high nutritional quality, Alfalfa hay is one of the best and most popular horse feed varieties available. Alfalfa is included in the rations for young growing animals, breeding animals, and adult working horses. Its high protein, calcium and vitamin content make it especially useful in balancing rations for brood mares and young growing horses. Its palatability makes it especially popular for horses that are finicky about eating. Alfalfa hay is harvested starting in early spring in southern states such as Arizona, and usually begins in May in northern Pacific Northwest states. Fields are cut several times each season, up to eight times in warmer growing regions. 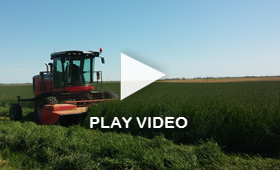 Nutrition is at its highest when Alfalfa is cut pre-bloom. This indicates that nutrition is maintained in the leaf and stem of the plant, instead of moving into the flower when the head is fully developed. 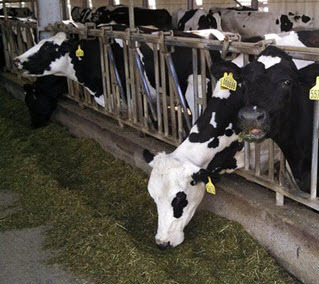 Nutrition plays a large role in the quality and grading of Alfalfa, in addition to texture and color qualities that vary according to specific livestock requirements.